With two boys graduating from high school in the past two years, I have been to my share of graduation parties lately. Each party had its own special vibe, by virtue of its host, location, food, guest list or activities. But they all had one thing in common: the all-important graduation photo display. Of course, as a guest, I love looking at photo displays. But when it came time to plan my own kids’ grad parties, this little must-have nearly put me over the edge. I don’t consider myself very craftsy, and I was sure it was going to look horrible. I can’t even cut straight. Besides, most of my kids’ photos were in shoe boxes. Unsorted. Sound familiar? But you have to start somewhere, so start by gathering photos. It’s easy to make prints of digital photos, but when it comes to those precious baby photos, you may want to make copies rather than risk ruining your originals. This is the perfect time to get digital copies made — then you can do whatever you want with them. (After dreading the task for weeks, it took me about an hour to scan 50-60 photos. Silly me. And I have used them about a million times since then.) If you don’t have a scanner at home, any photo processing store can do this for you. 1. Collage poster boards. Arrange your photos however you please. Get creative with text, and add color with mats or a colored background. There are no rules or limits, other than the size of your poster board (and you can always make more than one). Tri-fold presentation boards are great because they stand on their own. 2. Printed collage posters. Not into DIY? 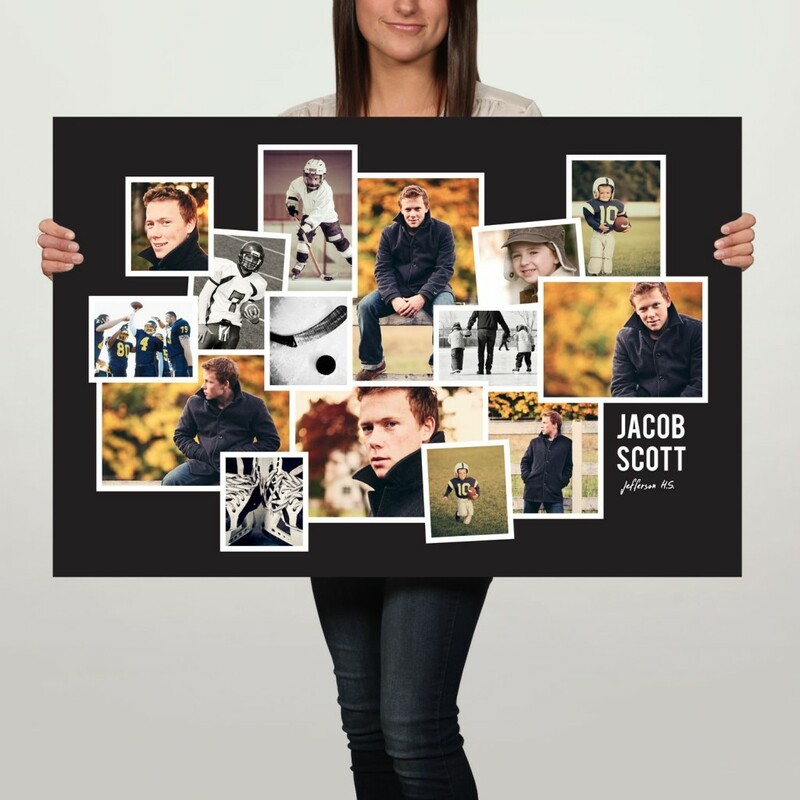 Pear Tree offers printed custom posters to make your display set up easy. Simply upload your photos and start adding them to the poster design you like best. These posters are printed on durable, tear-resistant polystyrene for indoor and short-term outdoor use. 3. Slideshow. If all your photos are in a digital format, it’s easy to create a slideshow using any photo editing software program like iPhoto. At the party, set up a computer monitor in a central place and set your slideshow to repeat infinitely. 4. Photos on the line. Drape rows of ribbon, wire, or colorful string around the room, or as a backdrop behind your serving tables, then hang photos with custom decor from the lines using clothespins. Simple, but dramatic! 5. Tabletop photos. Cover tables with colorful tablecloths, then scatter photos on the tabletops. Top each table off with a layer of clear plastic to protect the photos. 6. Life size cut-outs. Take a full-length photo of the grad and have it blown up to life size. It’s a fun way to decorate a door or wall. 7. Window frame collage. Use an old multi-paned window or door as a collage picture frame, or cover an old bulletin board in fabric for an easy backdrop. 8. Timeline themed display. It’s fun to line up the photos and see the changes in your child from year to year, especially when the photos are similar, like school portraits or sports photos taken every year at the same time. Do you have photo buttons from your child’s sports teams? Pin them all on a wide ribbon and use them as part of your display. 9. Photo albums or scrapbooks. Maybe you already have photo albums and scrapbooks that you don’t want to take apart. Simply set them out on a table for guests to view. Surround your books with other mementos such as awards or honors, and add something to symbolize future plans, such as a t-shirt or acceptance letter from the college they’ll be attending. 10. T-shirt display. A t-shirt says a thousand words! Okay, they’re not photos, but a collection of t-shirts from various teams, clubs and school events says a lot about the grad and makes a fun colorful display, either on a wall or on a clothesline. 11. Enlarged photos as focal points. Choose a few of your favorite photos and make enlargements to give your display a little variety. They don’t have to be high quality reprints — even a color copy on regular printer paper can be mounted or framed to look fabulous! Use them to decorate the food table, or place them strategically around the party as focal points. 12. Custom graduation party decorations and graduation napkins. How’s this for a cool idea? 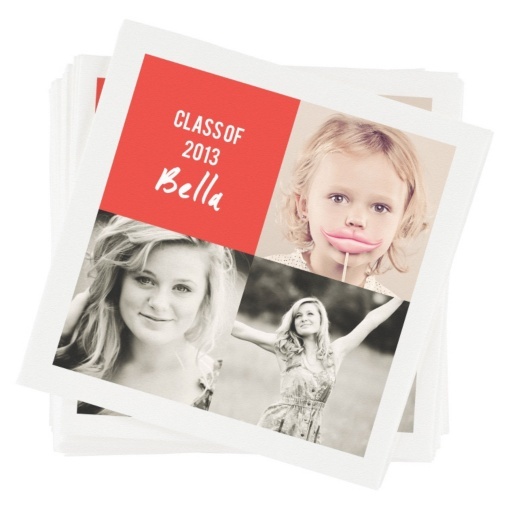 Table decor and napkins that you can personalize with your grad’s photos and choice of colors — new from Pear Tree! 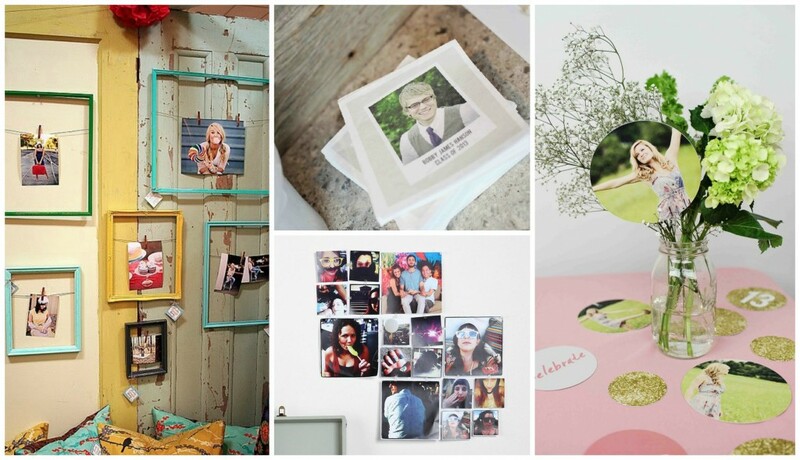 Good luck with your graduation photo displays and the rest of your party planning. We’d love to hear about any unique photo display ideas you have! 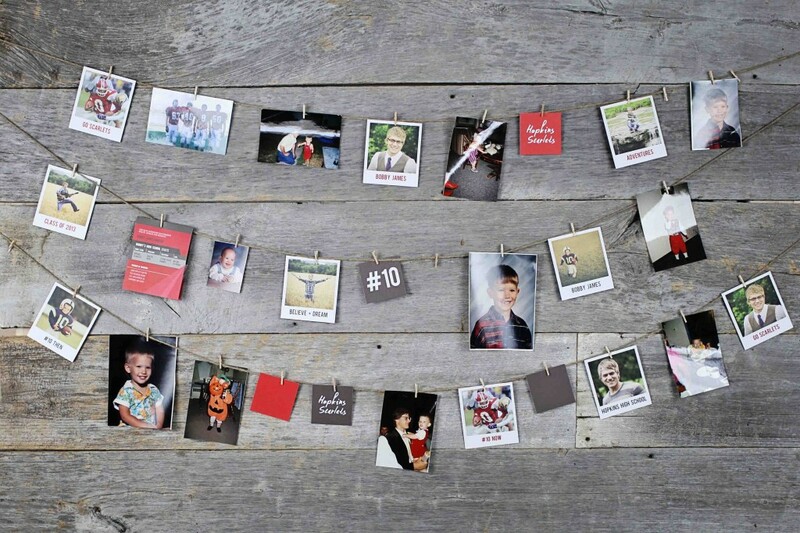 You’ll find lots more awesome graduation party ideas on our blog. 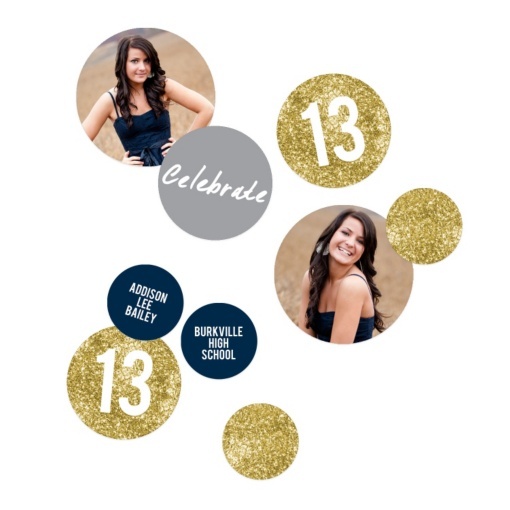 And be sure to check out Pear Tree’s personalized graduation napkins and graduation party decorations to add even more personality to your party!